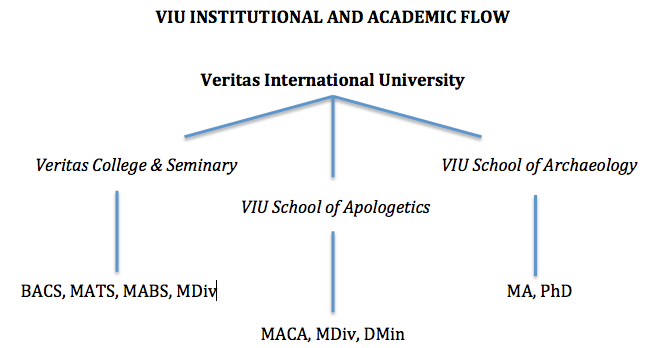 Veritas International University academic programs are open to mature Christian men and women who are academically and spiritually qualified. Spiritual qualifications are demonstrated through pastoral and general references included in the student’s admission packet as well as their signed agreement with the VIU Doctrinal Statement. The program involves research and study in specified fields pertaining to Bible, theology, archaeology, apologetics, philosophy, and pastoral studies, which requires the student’s time and diligence in order to complete (2 Tim. 2:15). Each program of study emphasizes an evangelical understanding of classical theology and biblical inerrancy in line with the Chicago Statements produced by the International Council of Biblical Inerrancy (ICBI). Students will be admitted to a VIU degree/certificate program which offers a number of academic outcomes depending on your chosen course of study that may be completed in as little as two, three or four years of study. Each degree program offered at VIU concentrates on the evangelistic and apologetic nature of each major studied. Veritas approaches apologetics and theology from a classical perspective, bringing all truth discovered in special and general revelation to each topic studied. Ultimately, during the student’s time at VIU, he/she is expected to develop and strengthen a comprehensive biblical worldview that unites the head (mind) and heart (will) together under Christ and His word. The resident program requirements are primarily fulfilled at our Orange County (CA) campus, though there are a limited number of courses offered at satellite teaching site (Albuquerque and San Diego). All 2 and 3-unit courses are primarily taught in traditional 15-week fall and spring semesters, supplemented by one-week module courses four times per year. Traditional semester courses meet once per week, in the evening from 6:30pm to 9:30pm. No more than one (1) module course will be offered during the fall and spring semesters, the other two modules will be offered during the winter and summer breaks. Unlike our intensive module courses that meet for four hours each evening for one week, Monday through Friday (6:00pm—10:00pm), and seven hours on Saturday (9:00am—4:00pm). Each module course has 27 hours of in-class meeting time, with the remainder of the course being fulfilled over the next 14-weeks through distance learning (outside the classroom) research and testing through substantive and regular interaction with the professor. All assignments are outlined in the course syllabus. By the end of your course all assignments must be postmarked and submitted to your professor for grading. VIU offers interactive distance learning courses through an online 7-week format. The non-resident distance education program consists of two 7-week modules per semester (Fall 1 and 2, and Spring 1 and 2) and one 7-week module per summer. The two terms held in fall or in spring are separated by a one-week enrollment period. Distance courses are fulfilled through the VIU online learning platform POPULI. Undergraduate. The undergraduate (BA in Christian Studies) may be completed entirely by distance learning without residency requirement, though undergraduate students are welcome to enroll in on-campus graduate courses (though students would receive an undergraduate syllabus). In addition to coursework, the undergraduate distance program relies on substantive interaction and discussion opportunities with the instructor and peers as coursework is completed over a 7-week period. After each 7-week period is complete an enrollment period follows.